Oats and whole grains are good sources of fiber, which is essential for heart and digestive health and aids in weight loss. However, sometimes eating oats and whole grains can make you feel bloated; it's as if your stomach is heavy and full of air. Oats and whole grains also can cause embarrassing gas to occur. Fiber helps keep your digestion running smoothly, but fiber itself can't be digested. It moves into your lower intestine where it's broken down by bacteria that occurs naturally in your body. When this happens, carbon dioxide and hydrogen are produced. About a third of the population will produce methane as well as a result of the fiber being broken down. When these gases build up, you can look and feel bloated. You might have pain in your abdomen from the pressure of the gas as well. Celiac disease damages the lining of the intestines and keeps your body from being able to absorb nutrients. This is the result of a bad reaction to gluten, which is found in whole grains. It may be found in oats as well. Celiac disease may sound like a food allergy, but it's actually an autoimmune disorder. People often outgrow food allergies, but celiac disease is an illness that will be with you your entire life, though you can control the symptoms. Celiac disease can make you bloated and gassy. People with celiac disease also may have diarrhea, constipation, appetite changes, nausea, vomiting, lactose intolerance -- which may go away once your celiac is being treated -- bloody, fatty or foul-smelling stools or unexplained weight loss. Since celiac disease prevents your body from absorbing nutrients, you also may experience symptoms of malnutrition if the disorder is left undiagnosed. Symptoms include hair loss, depression, fatigue, easy bruising, missed menstrual periods, nose bleeds, muscle cramps, seizures, joint pain and itchy skin. 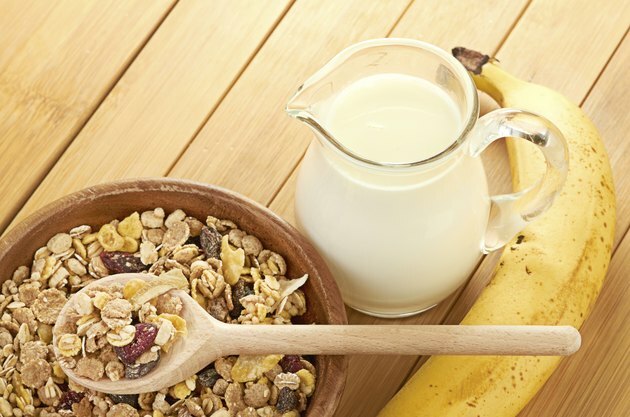 If you notice that you become bloated and gassy when eating certain grains -- wheat, barley and rye -- and oats, call your doctor if you're concerned. You should be tested for celiac disease before making any dietary changes so that the results of the testing aren't affected. If you are diagnosed with celiac disease, you will have to eliminate certain grains, oats and all other sources of gluten from your diet. In addition, your doctor may prescribe vitamin supplements to restore the balance of nutrients in your body. He may prescribe a short-term round of corticosteroids if your celiac disease isn't responding to the other treatments. Once you've eliminated gluten from your diet, your intestines will begin to repair themselves and you will be able to absorb necessary nutrients again. You must continue to follow the gluten-free diet indefinitely to avoid feeling bloated or gassy.